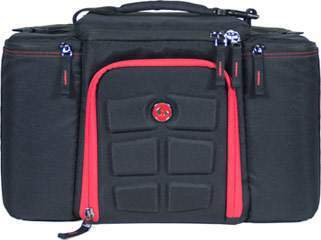 6 Pack Fitness Innovator 300 is the latest innovation in meal management bags for the fitness elite. Utilize our 6 pack bags to travel effortlessly with more than 3 meals, sports nutrition products and supplements. The fully insulated interior in our six pack bags keep meals fresh and safe, hot or cold. Cool Tech Lining. Each 6 pack bag comes in black with red trim. TRIPLE OMEGA 3-6-9 Fish and Flax Oils contain a proprietary blend of essential oils, including Flaxseed Oil and Ester Omega Fish Oil. Saw Palmetto is an extract derived from the berry of the Saw Palmetto tree and is one of the leading traditional herbs for men’s health. ** Saw Palmetto has been traditionally used to support prostate and urinary health in men. ** Our Saw Palmetto Extract is in a 250 mg dose. This 4:1 extract is equivalent to 1,000mg of Saw Palmetto. Adult men can take one softgel once or twice daily. Healthy Inner Colonies = Immune System Support. The intestinal tract is a primary line of defense for the immune system. In fact, approximately 70% of the body’s immune system cells are located in the digestive system – which is precisely where your body’s probiotic colonies live. How Does Multi Culture Probiotic Work? Dairy/Yogurt may vary in types of strains and number of probiotic organisms. Yogurt may supply calories, sugar and fat that some wish to avoid. Those with mild lactose intolerance or dairy sensitivities may not be able to enjoy yogurt. Nature’s Origin Multi Culture Probiotic may be your answer. Each Multi Culture Probiotic serving is precisely formulated to supply 10 carefully chosen probiotic cultures and 20 billion microorganisms†, for peak probiotic support without all of dairy’s calories, fat, sugar or digestive concerns. ** Each serving supplies minimal dairy and lactose, much less than you will find in a serving of yogurt. Why Take Nature’s Origin Multi Culture Probiotic? No Artificial Color, Flavor or Sweetener, No Preservatives, No Sugar, No Starch, No Soy, No Gluten, No Wheat, No Yeast, No Fish. Sodium Free.